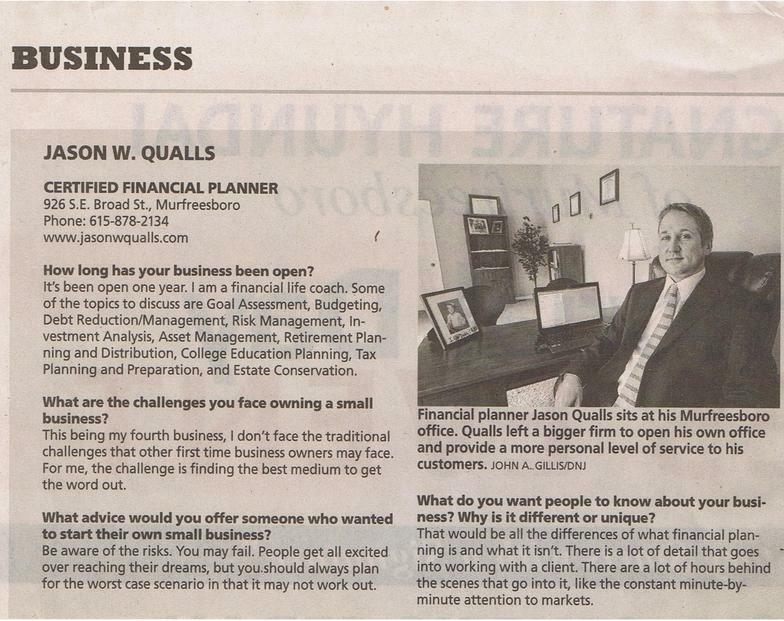 Jason W. Qualls, CFP® is the founder of Fortitude Financial Planning, a Fee-Only Firm located in Murfreesboro, Tennessee. 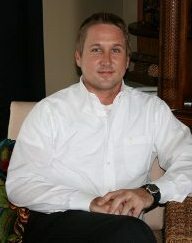 Jason began his career in the financial services industry in 2001. He is also the host of "Financial Coaching Radio" on WGNS FM 100.5. He coaches individuals and business owners on comprehensive financial planning including budgeting, risk management, investment management, retirement planning, tax planning, and estate conservation. His unique approach to investing and financial planning stems from his strong belief that most financial advisors are often driven more by how to sell you financial products than by sound financial principles. Ultimately, it is his level of competency, care, and integrity that he provides that truly differentiates him from traditional Financial Advisors. I began my career in 2001 with a highly respected insurance company that was just beginning to establish itself as a major player in the financial services industry. Out of the gate, I devoted my practice to providing holistic financial planning to my clients, but quickly learned that my vision wasn't always supported by my superiors. Like many other established insurance and investment firms, they had developed a very strong sales culture. But that type of environment usually doesn't align well with true financial planning. They were mistakenly trying to turn financial planning into an event, when in reality it is a process. In 2004, I passed the Certified Financial Planner examination, making me one of the youngest in my state to do so. In 2005, I was offered the opportunity to join the wealth management division of the company. There I advised the high net worth, focusing on investment management and estate tax planning. I had reached a level of financial success I had always dreamed of, but the sales culture of the organization was slowly beginning to destroy my passion for the business. Everyday, I witnessed too many of the company's Financial Advisors use the terms "Financial Planning" as ploy to sell their clients questionable, high-cost financial products. I was even more disgusted by the fact that the company's management team seemed to almost encourage this behavior. In 2007, my wife and I were blessed with our first child. The birth of my son led me to re-evaluate my career path. I decided that I could no longer devote my life's work to an organization that had such major conflicts of interest with its clients. I determined that in order for me to provide my clients with truly objective advice, I would have to find a way to remove all conflicts of interest. My dream was to create a firm where clients could receive unbiased financial advice, and not have to worry about the advisor selling them a financial product in which they had a financial stake. But before I could chase my dream, I would need to get myself into a financial position to make this possible. 2007 was a great year for the stock market; the Dow Jones Industrial Average had reached an all-time high of 14,000. Our economy seemed it could shrug off anything. The real estate market had also seen astronomical growth in recent years, but was beginning to show signs of weakness. And I wanted to capitalize on that weakness. 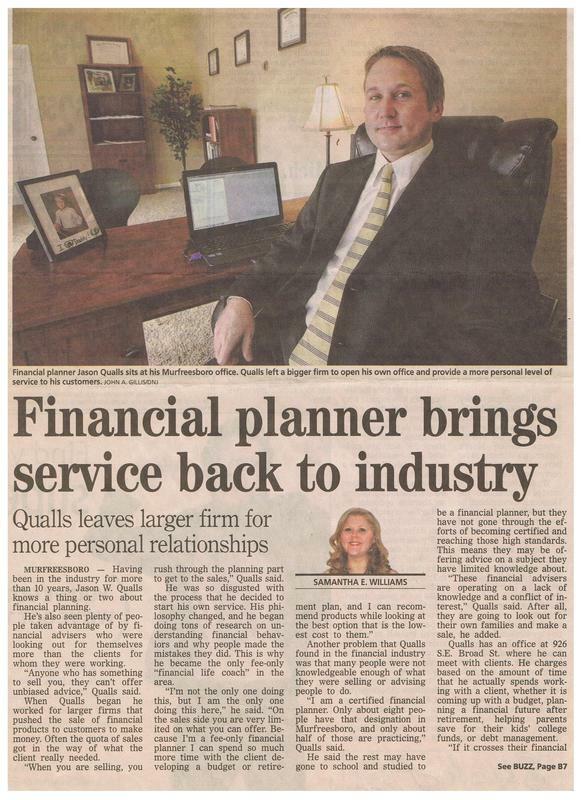 I felt real estate was the perfect opportunity for me to quickly replace my income, and allow me to start my own true financial planning firm. In 2007, I founded a real estate investment company that focused on buying distressed properties below market value. I got off to a fast start by using a technique called wholesaling and also positive leverage. Wholesaling, in a nut shell, is where an investor puts a property under contract and assigns or resells the property to another investor. Positive leverage is frequently used by investors wishing to take advantage of short term investment opportunities, and involves the investment of borrowed funds at a rate of return higher than the interest rate on the loan. Everything was going just as I had planned. I felt like a genius. By mid-2008, I was doing well enough that I decided it was time for me to resign from my position at the wealth management division. My decision to resign apparently ruffled a few feathers. Because the company I devoted 7 years of my life to made an attempt to tarnish my reputation by stating some untrue remarks on my Form U-5. Anyone that has ever been licensed to sell stocks, bonds, and mutual funds has what's known as a Form U-5 that follows them. In theory, the intent of this form is to protect the public from rogue reps, like Bernie Madoff for example. But a sad truth is that brokerage firms can say anything they like on a departing broker's Form U-5, even if it's defamatory and untrue. This is because of a ruling that entitles them to absolute privilege for the statements they place on the U-5 of a departing registered representative. I have never had a client complaint, a trading violation, or violated any significant regulatory rule. But that didn't prevent my former broker/dealer from making false statements on my U-5. To say the least, I was furious about the untrue remarks. But what made it even worse was that there was nothing I could do about it because of their absolute privilege. After fighting a losing battle in an arbitration case due to their absolute privilege, I just had to accept it and move on. I was now more determined than ever to reach my goal of forming a truly independent firm. But would be completely blindsided by what was about to happen to the U.S. economy. Within just 3 short months after tendering my resignation, BOOM! The real estate market collapsed and the credit market was in shambles. I wasn't the only one who had been placing some big bets on the future value of real estate. Almost every large investment company in the country had done the same by creating very complex financial instruments. These complex financial instruments ended up becoming worthless bringing our whole economy to its knees. The economic collapse forced me to dissolve my real estate investment company in early 2009. I nearly lost everything. Of course, Wall Street and the big investment firms were the source of the 2008 debacle that gobbled up my business, but the person I saw looking back at me in the mirror each morning was really to blame. Wall Street didn't put a gun to my head when I thought I could outsmart economic risk. I had somehow chosen to leave behind all the risk management principles that would have protected me. That experience taught me a lot about myself and personal finance that you just can't learn from a textbook. Instead of blaming everyone else, I accepted personal responsibility and found my resolve. I went back to applying the sound financial principles I had learned as a young entrepreneur and CFP®. I also studied everything I could get my hands on regarding the psychology of personal finance. I wanted to know why so many smart people had taken so many stupid risks. More importantly, why did I take those risks? I also realized after the 2008 crash that the investment philosophy that most financial advisors put their faith in turned out to be completely wrong. When I saw Alan Greenspan, the former Chairman of the Federal Reserve, admit that many of his ideologies he used over the last 20 years turned about to be a mistake, I embarked on another search to develop an investment philosophy that could protect my clients from another future horrific down turn in the global markets. Armed with a new outlook on investing and personal finance, I started my third small business in 2009. I used my knowledge of finance and marketing to rapidly expand the company. And in less than two years, I sold the company to a larger competitor for almost seven times my intial investment. Now I would be able to follow my vision of forming a true financial planning firm. I formed Fortitude Financial Planning, a fee-only financial planning firm, with a purpose of helping families achieve financial freedom by providing objective, unbiased advice. I am on a mission to educate my community about true financial planning through a process I call Financial Life Coaching which focuses on your hopes and dreams, NOT selling you financial products. My experiences have taught me more about risk and investment management than many will ever know, giving me a leg up on most Financial Advisors. I have nine letters after my name which may make you think that I am pretty smart. But I believe it is my life experience that has provided me with true expertise in personal finance. We gain wisdom from experience. But we only gain experience by making mistakes. Click here to learn about how I can help you. We all fail. Only some of us have the Fortitude to pick ourselves back up. It's very simple. As a Fee-Only Financial Planner I put your needs first. I don't sell any products. I don't receive any commissions, referral fees or kick-backs. I only make recommendations that are in YOUR best interest.